At first Ho Chi Minh City feels suffocating. First time visitors find it difficult to catch their breath amongst the chaos and congestion. The streets are besieged with an army of ruthless motorcyclists who patrol the streets day and night, making a constant racket and making crossing the road potentially fatal. There is no shortage of attractions in Saigon, and the main sights are conveniently located in the compact downtown district. This area of the city manages to juxtapose old and new with considerable elegance and taste. Ho Chi Minh City lacks the heady blend of cultural collection found in Hanoi; however, the city still has plenty to offer on the entertainment front. Aside from day time frolicking in the city's water parks, visitors can hit the town after dark to sample local nightlife. Diners in Ho Chi Minh City can sample a wide variety dishes from all over Vietnam, as well as an array of international flavors. One of the joys of eating out in Vietnam is finding quality authentic food for a cheap price. Unfortunately, restaurant prices are on the increase in the city, rising 30 percent each year, and as the city becomes more cosmopolitan, finding bargain food is almost impossible. 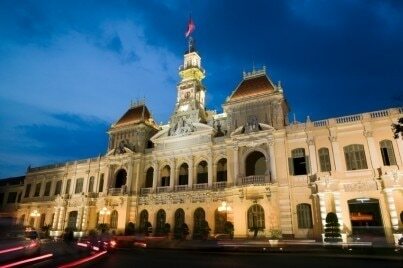 Ho Chi Minh City is well equipped for tourists and the locals are very welcoming towards all nationalities. The main danger in the city is the traffic, so pedestrians should be very careful and if possible, shadow a local when crossing a busy road. Travelers who haven't driven in Asian cities should stick to public transport, as traffic is highly undisciplined and many local drivers act ruthlessly on the road. From high-end off the peg boutique originals to beautiful hand-carved souvenirs, shoppers are well catered for in Ho Chi Minh City.